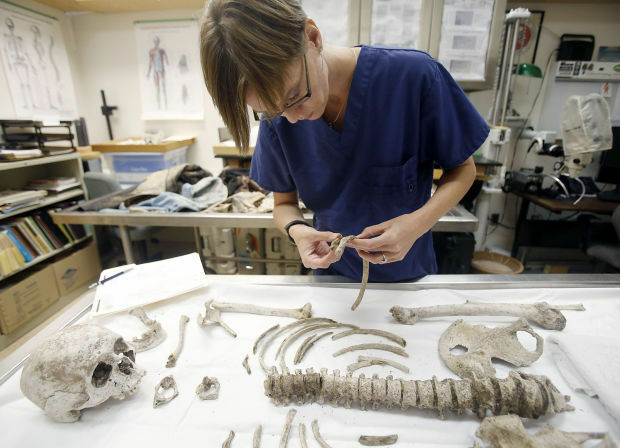 Traci Van Deest, a forensic anthropology postdoctoral fellow, takes inventory of a set of remains that was found in 2014 near Ajo at the Pima County Office of the Medical Examiner. Photo by Mamta Popat/Arizona Daily Star. Hundreds of people die or are reported missing each year while trying to cross the border illegally, but there’s no accurate count due to a patchwork of practices along the border. University of Arizona researchers hope to change that with a new best-practices manual designed to standardize the identification and examination of unauthorized border-crosser remains. A standard criteria along the entire border would help ensure an accurate count of bodies examined and a better estimate of how many people are dying trying to cross the border, said Raquel Rubio-Goldsmith, a forensic investigator with the Binational Migration Institute at the University of Arizona. Since 2000, more than 2,000 people have died while crossing the border in Arizona, until recently the busiest spot for crossings and deaths. But aside from the Office of the Medical Examiner in Pima County, which is seen as the gold standard, no other entity systematically tracks how many immigrants’ remains are recovered. As migration patterns shift, so has the share of people dying in Texas — particularly in Brooks County, where most die while hiking through rugged ranchland trying to circumvent a Border Patrol checkpoint. So far this year, the remains of about 30 people have been recovered in that county alone, compared to about 50 in Southern Arizona. And many of them are not identified. Part of the problem is a lack of training and resources. It took years for the Pima County Medical Examiner’s Office to develop supplementary autopsy report forms that help with future identification, to learn about fingerprinting techniques when remains are mummified and to continuously update a database with information, including GPS coordinates, of undocumented border-crosser remains. Of 35 counties that responded to a survey that helped shape the best-practices manual, only 40 percent said they consistently retain records of the unidentified.